Honestly, I’m extremely surprised just how well the cards are working to give meat and detail to the scenes. In the first scene, the card ended up making Sarah paranoid that everyone is against her, and in the second scene, I made what was supposed to be a party into a high-stake job interview that is bound to go bad. The third scene, however, promises to get even crazier. –until I drew this card. What would your hero do if confronted by a mindless, unstoppable horde? Oh boy. At first glance, this story is about to get really fucked up interesting. I always love me a good B-rated horror flick set somewhere in the mid-west. But for this story, I didn’t really think along those lines. But before we get too crazy too fast, let’s read the detail card for “Zombie Attack”, shall we? “Zombies” don’t have to be the walking dead. From soccer hooligans to snotty seniors to social media swarms, there are mobs in every genre. Unlike individual adversaries, crowds can’t be confronted or reasoned with. Your hero may need to flee or take shelter — perhaps with others survivors. Whether real or metaphorical, all zombies have weaknesses, and it’s up to your hero to figure out what those are. Perhaps there’s even a cure. But finding it won’t be easy. A’right. Instead of literally introducing Zombies, we instead should think about a horde of some sort. First thing that comes to mind is a gang. The initial idea of mobsters was good, but I can’t see them coming up in full-force, unstoppable horde-style for a bit of cocaine and a small-time dealer. So I need another group, and the gang seems to fit that profile perfectly. A biker-gang, of course. Maybe the regulars of Hell’s Kitchen–the bar they’re supposed to drop off the drugs at. They were told the bar will be closed in the morning, so they can have their meeting outside and get it over with. But we already know (thanks to the outline) that they’re going to be late (by several hours). I’m guessing chances are that the client left, pissed, and the bar ended up opening. Which means the biker-gang showed up to hang out. What exactly happens at this point I needn’t brainstorm too much, since this scene plays well after that and later scenes will explore the groups arrival at the bar (and since I can’t know just how the cards will screw me up until, including, then, I better not go too crazy on planing it). Whats important is that Mitch is being held captive by a biker-gang, they want the case of cocaine (so they know what the deal is here), and Mitch has to somehow convince them to let him live and work for them to get it back. The gang’s name should be something just as cliche. Along the lines of “Lost Boys” or “Hell Riders” or something (comparison to actual gangs not intended and purely coincidental). That sets the stage for the scene somewhat. 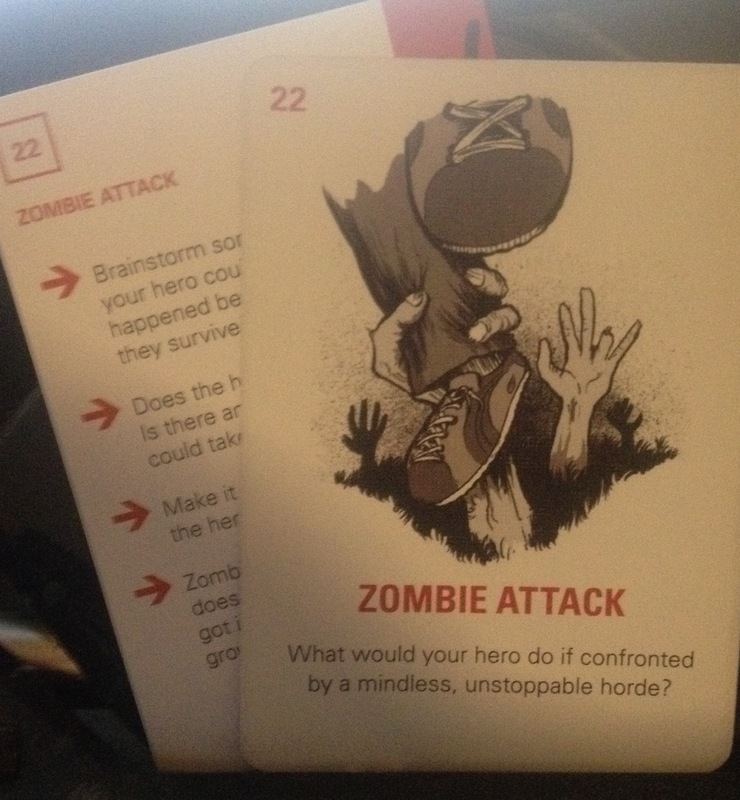 Lets get into the questions on the back of the detail card of “Zombie Attack”. Brainstorm some experts your hero could consult. If this happened before, how did they survive? Consulting isn’t much of an option, given how dire the situation is. But maybe Mitch has dealt with gangs, or this gang, before, and knows a few people in it. Perhaps that’s the only reason they don’t just get rid of him in the first place. Does the horde have a leader? Is there any way your hero could take over that spot? No gang is without a leader. And officers, perhaps. Chances are, Mitch won’t even consider to take over the gang (never rode a motorcycle in his life). But bringing in the leader might not be a bad idea. Maybe the leader is an old pal of Mitch’s late father. Maybe his dead dad used to be member in the gang, which is why Mitch got started in the wrong path in the first place. And which is why the gang won’t kill him right away. Mitch and Leader know each other. Make it personal. Let someone the hero loves join the mob. Guess I sort of answers that before. Mitch’s father was part of the gang before he died. Good friends with the leader of the gang. Zombies want brains. What does your crowd want? If they got it, would they disperse or grow stronger? Awesome. We went from a small-time drug deal to something truly terrible. Gangs, mobs, drugs, war over territory. How can any of that go wrong? Any ideas, thoughts, comments? Would you have done anything differently? This Post is brought to you by some amazing people supporting me and my Patreon campaign. Check out my Backer Wall!